As the editors of post: notes on modern and contemporary art around the globe (www.post.at.moma.org), we would like to introduce museum and classroom educators to this free, online resource on global art from The Museum of Modern Art. Featuring essays, interviews, archival materials, bibliographies and more that reflect new perspectives emerging in art history today, post makes an excellent supplement to courses on non-Western art at both the undergraduate and graduate levels. post is the public face of the Museum’s Contemporary and Modern Art Perspectives (C-MAP) initiative, which is a cross-departmental, internal program that fosters the multi-year study of art histories outside North America and Western Europe. 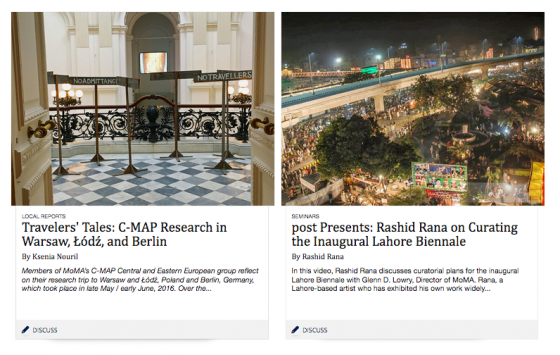 Founded in 2009, C-MAP emerged from a long history of international outreach at the Museum, including projects of the International Program and numerous curatorial initiatives. The initiative, composed of over 50 staff members from 16 departments, is currently organized into three research groups that focus on Asia, Central and Eastern Europe, and Latin America. 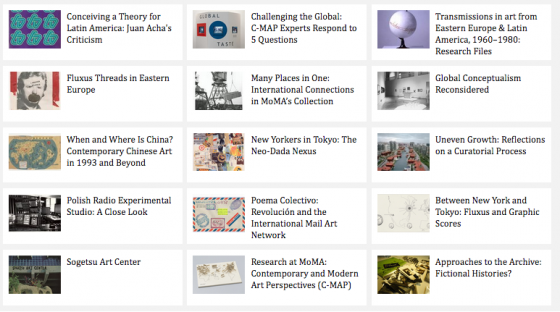 As of writing, C-MAP has impacted 18 exhibitions and contributed to 1,136 acquisitions at The Museum of Modern Art. The program has invited over 200 domestic and international scholars, artists, and other cultural practitioners to the museum and those involved with the program have met over 400 more across 15 research trips to the focus regions. post is a platform to access some of this research, particularly through the “5 Questions” series of video interviews conducted with C-MAP guests, as well as new research and resource materials from the MoMA Collection, Archives, and Library. Generating research has been the aim of C-MAP since its inception, and in keeping with this, post was launched in 2013 to commission and publish scholarly and archival material. post invites contributions by individuals and institutions from around the world while also making behind-the-scenes research at The Museum of Modern Art available to a broader public. While a portion of content on post is generated internally from monthly C-MAP group meetings, annual research trips, and periodic joint group seminars, we also commission contributions from a growing international network of scholars, artists, and curators. From the homepage, you can navigate the website in multiple ways, based on your interests and needs. Using the tabs at the top, you can filter content by region (Asia, Central and Eastern Europe, Middle East and North Africa, Sub-Saharan Africa, The Americas); decade (from 1900 to the present); and content type (Essays, Curated Selections, Interviews etc.). You can also navigate the site using “Themes” that address larger, conceptually or historically driven issues within and across the regions. For example, the theme “Global Conceptualism Reconsidered” considers the eponymous 1999 exhibition at the Queens Museum through new interviews with some of its region-specific curators as well as reflections by Rachel Weiss and the late Jane Farver. A large part of the content on post is related to the histories of collecting and programming at The Museum of Modern Art, which in turn reflect the history and present status of the Museum’s commitment to art and artists emerging from geographies and contexts outside Euro-America. The theme “Many Places in One: International Connections in MoMA’s Collection” presents short catalogue entries by MoMA curators, staff, and invited specialists, discussing works in the collection that may not have had an extensive exhibition history or are recent acquistions. 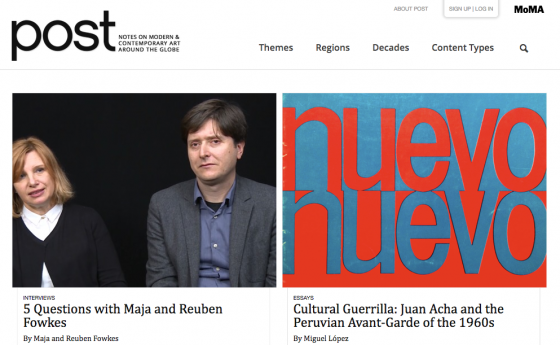 We are also invested in contextualizing (through essays and/or annotations) and presenting newly digitized and translated primary source materials, both from within MoMA’s archival holdings and elsewhere, to further academic and curatorial research. The commissioning and production of content for post is managed by the three C-MAP fellows — Jerónimo Duarte-Riascos for Latin America, Rattanamol Singh Johal for Asia, and Ksenia Nouril for Central and Eastern Europe — with Linnea West, C-MAP Program Administrator. The website also has an editorial board, comprising senior staff from different Museum departments, including Education, Library, and Publications. The board discusses new content proposals on a bimonthly basis, and makes decisions on commissioning and editorial fine-tuning. New content is published on post weekly, so be sure to stay tuned! Sign up on the homepage to receive the quarterly post newsletter, highlighting recently published research materials from across the world. Jerónimo Duarte-Riascos is the Contemporary and Modern Art Perspectives (C-MAP) Fellow for Latin America at the Museum of Modern Art, New York. He is a PhD candidate in Spanish and Latin American Literatures and Visual Studies at Harvard University. He holds a B.A. in Law and Literature, an M.A. in Literature and Modern and Contemporary Art History and Theory from Universidad de los Andes in Bogotá, and an M.A. in Romance Languages and Literatures from Harvard University. His research cultivates dialogues between Contemporary Latin American Visual Arts and Literatures. His work produces projects deeply rooted in pertinent academic research that encourage conversations between both scholarly and non-scholarly audiences, and that present artistic practices as communal experiences rather than as inaccessible objects. He has worked as an editor, curator, researcher and teacher. Rattanamol Singh Johal is the Contemporary and Modern Art Perspectives (C-MAP) Fellow for Asia at the Museum of Modern Art, New York and a Helena Rubinstein Critical Studies Fellow at the Whitney Independent Study Program. He has previously worked in various capacities, including curator, archivist and publications editor at Khoj International Artists’ Association in New Delhi. He entered the Art History doctoral program at Columbia University in 2013 after earning a BA in Art History & Political Science at the Macaulay Honors College, CUNY (2009) and an MA at the Courtauld Institute of Art, London (2011). Ksenia Nouril is the Contemporary and Modern Art Perspectives (C-MAP) Fellow for Central and Eastern Europe at the Museum of Modern Art, New York. A PhD candidate at Rutgers, The State University of New Jersey, Ksenia is completing her dissertation on the practices of contemporary Eastern European artists who actively question and engage with history and historical representations of communism. From 2011 to 2016, she was a Curatorial Fellow at the Zimmerli Art Museum at Rutgers, where she organized Dreamworlds and Catastrophes: Intersections of Art and Technology in the Dodge Collection, an exhibition examining the consequences of innovations in science, technology, mathematics, communications, and design on Soviet unofficial art. Ksenia has published in The Calvert Journal and ARTMargins Online. Linnea West coordinates the Museum of Modern Art’s global research program, Contemporary and Modern Art Perspectives (C-MAP). In May of 2015, she graduated with a Master of Art degree in Art History from The University of Georgia, where she focused on contemporary art and researched public art and monuments in Central and Eastern Europe. She was awarded a Fulbright grant to research representations of national identity in contemporary Hungarian art at the Ludwig Museum of Contemporary Art, Budapest in 2012-2013. Publications include the chapter “Diplomatic Failure: ‘The Body of Nefertiti’” iin the forthcoming book Art as Cultural Diplomacy: European Perspectives (Cambridge Scholars Press, 2017) and catalog entries in Paper in Profile: Mixografia and Taller de Gráfica Mexicana (Georgia Museum of Art, 2016). Prior to these experiences, she worked in publishing in New York City. Since 2008, she has written art criticism on the blog “Art Ravels: Arts and Culture Unwound” (linneawest.com/blog), named by Huffington Post as one of the top five New York City art blogs.